If you’re a licensed professional in the Philippines, you must have gone through many hours of mandatory trainings and seminars just to earn continuing professional development (CPD) units to renew your license. While some of the seminars may be useful, many professionals have found them time-consuming, costly and even a waste of time, especially if they happen to have attended boring or useless lectures. A group of lawmakers have heeded many professionals’ complaints, and filed a proposed law, House Bill 7171, that puts an end to all those trainings and seminars. Filed early February, the bill will repeal Republic Act 10912 or the Continuing Professional Development Act of 2016. It will end the mandatory completion of CPD programs as a prerequisite for the renewal of licenses of professionals. In its explanatory note, the bill’s authors stressed that the CPD requirement for professionals has become burdensome for licensed professionals. “RA 10912 has imposed multiple financial, logistical and psychological burdens on professionals.” The bill was filed by party-list representatives Antonio Tinio and France Castor of ACT Teachers, Carlos Isagani Zarate of Bayan Muna, Emmi de Jesus and Arlene Brosa of Gabriela, Ariel Casilao of Anak Pawis, and Sarah Jane Elago of Kabataan. Under RA 10912, professionals defined as “persons who are registered and licensed to practice their profession in the Philippines, and who hold valid Certificate of Registration and Professional Identification Card for the Professional Regulation Commission (PRC)” must meet the number of required CPD units of their profession within three years before they can renew their licenses. CPD programs include learning activities such as seminars, workshops, technical lectures, subject matter meetings, tours and visits, non-degree training lectures, activities and professional work experience. Each profession has its required number of CPD units ranging from 10 to 100. However, for the bill authors, requiring professionals to undertake CPD programs does more harm than good. “They are forced to spend thousands of pesos, take unpaid leaves from work, endure long queues and go through a host of other hardships,” the note read. The Professional Regulatory Commission (PRC) has listed a total of 44 regulated professions that require its practitioners to undergo CPD programs. Each profession has a different required number of units. Certified public accountants (CPAs) have the highest number of mandatory units at 100, while X-Ray technologists, chemical laboratory technicians, and Real Estate (RE) salespersons have the lowest requirements at 10 units. The CPD requirement for some professions will increase by 2019 as in the case of CPAs, who will need a total of 120 units. Other professions like dentistry, mechanical engineering, medical technology, to name a few will require a higher number of CPD units as well. Costs of CPD programs provided by PRC-accredited institutions or organizations vary. 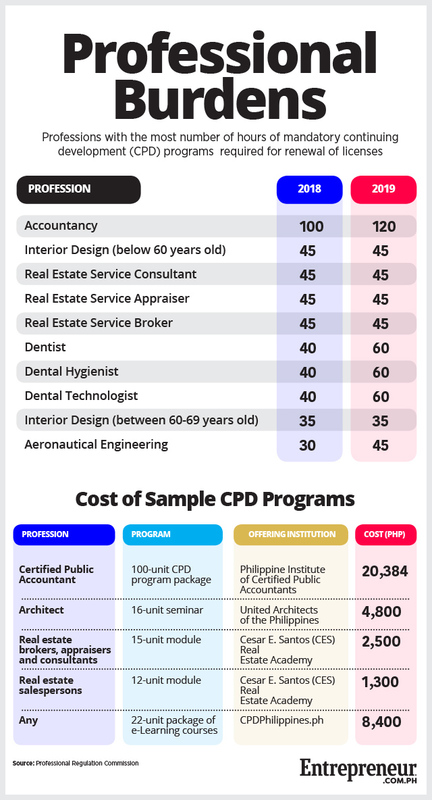 For example, a 100-unit CPD program package for CPAs offered by the professional organization, Philippine Institute of Certified Public Accountants cost Php20,384 while a 16-unit seminar offered by the United Architects of the Philippines requires Php4,800. On the other hand, a 12-unit module for Real Estate (RE) Salespersons by the Cesar E. Santos (CES) Real Estate Academy costs Php1,300 and a 15-unit module for RE Brokers, Appraisers and Consultants is Php2,500. Online CPD programs are available, too. For example, CPDPhilippines.ph, an accredited online CPD program provider offers a 22-unit package of e-Learning courses for Php8,400. But for the bill’s sponsors, spending for CPD programs is unnecessary since the requirement is redundant as there are sufficient mechanisms in place to ensure competence and competitiveness among professionals. “Prior to its enactment, laws and regulations, including the various professional charters, code of conduct and complementary administrative issuances governing all of the 53 existing professions, were sufficient to regulate the practice of these professions,” the note said.